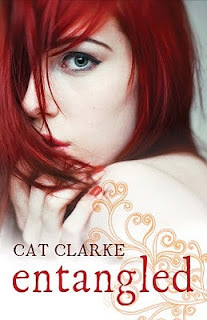 Entangled by Cat Clarke is about seventeen year old Grace, who wakes up in a white room with a table, pens and paper. And no clue as to how she got there. I really enjoyed reading this book and as a result I have read it twice already! I enjoyed reading about Grace's desperate journey to remember. I think the cover is beautiful and suits the book well. Oh goody another grace truly a great cover red my fav. color XD thanks for sharing your thoughts.